MIAMI (AP) The Orlando Magic found the right setting for a rare road win. Mario Hezonja scored 20 points and Jonathan Simmons made the tiebreaking dunk with 1:31 remaining as the Magic beat the Miami Heat 111-109 on Monday night. Starting for the injured Aaron Gordon, Hezonja shot 7 of 14 from the field and 4 of 9 on 3-pointers as the Magic won their third road game in the last 24. They dropped Miami to just 13-11 at home. ”I’m not paying attention too much to my game because I know my game, I know what I can do, but as long as we are winning I am happy that I am helping my teammates,” Hezonja said. The Heat appeared to tie the game after Tyler Johnson was credited with a basket when Orlando’s Bismack Biyombo was called for goaltending with 2.8 seconds remaining. A video review overturned the call. Marreese Speights’ consecutive 3-pointers capped a 12-2 surge and his second one extended Orlando’s lead to 99-89 with 11 minutes remaining. Speights finished with 12 points. The Magic withstood a 16-2 Miami run late in the fourth quarter. Josh Richardson’s layup with 2:53 remaining tied it at 109 before Simmons’ dunk put Orlando ahead for good. Richardson scored 20 points for Miami, which lost its fourth straight. Hassan Whiteside added 19 points and 14 rebounds, and Justise Winslow finished with 16 points. The Heat have now started their last two homestands with losses against the last-place teams in the Eastern and Western Conferences in Orlando and Sacramento. Simmons and D.J. 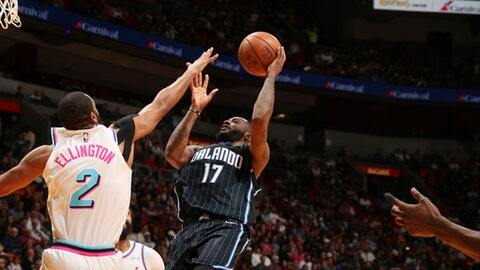 Augustin scored 16 points apiece for Orlando. Evan Fournier finished with 13 points. The Heat missed all 12 3-point attempts in the first half. But 16 points in the paint helped Miami build a 29-17 lead in the first quarter. Consecutive 3-pointers from Simmons keyed a 10-2 run the final 1:13 of the second quarter that got the Magic within 60-59 at halftime. Orlando then scored 34 points in the third. Magic: Leading scorer Gordon missed his fourth consecutive game because of a strained left hip flexor. The injury also forced Gordon to withdraw from the Slam Dunk contest during All-Star weekend. Gordon participated in the previous two Slam Dunk contests. Utah rookie Donovan Mitchell will replace Gordon. Heat: Kelly Olynyk left with a left shoulder strain midway through the first quarter and didn’t return. Olynyk fell hard to the floor after positioning for a charging foul on Biyombo. . Olynyk was scoreless, ending a streak of 11 consecutive games in double figures. . Miami made 20 free throws in the first two periods, a season high for a half. The Heat have lost by six points or less in their current losing streak. The two-point margin against Orlando coupled the two-point deficit that started the streak in Cleveland Jan. 31. Miami also lost by six and four points against Philadelphia and Detroit, respectively. ”Just a few small breakdowns. In the last few games they’ve been critical,” Richardson said. Magic: Host Cleveland on Tuesday. Heat: Host Houston on Wednesday.